The market for centralized indentity-driven personal profile pages is getting increasingly interesting, with players like About.me (see writeup) and Google (see writeup) in the mix alongside established social networks such as LinkedIn, Facebook and Twitter. One of the newer entrants, nearing exit from private beta, having recently joined the well-regarded 500 Startups accelerator, is a service called Zerply, who aims to connect a hybrid of your professional background with your social profiles. 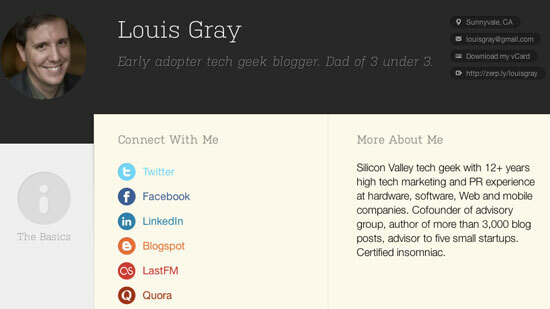 Like About.me, Zerply profiles are tightly designed. 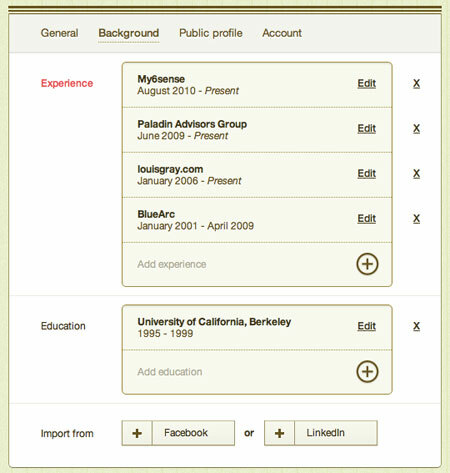 Unlike About.me, which relies heavily on creative background art from the profile owners themselves, Zerply presents multiple themes to select, and once you've provided your social profile accounts and vacuumed up your professional history from either LinkedIn or Facebook, lays out the content in a pleasant way. Zerply profiles lead with a short one-line description, as you see in most places, including Twitter, and a short bio, which can be anything you like of course. Visitors can download your vCard, email you, or check out your activity from around the Web. 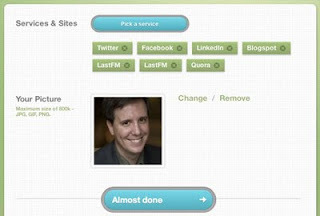 Dozens of social sites are supported, including all the regulars. The basics is your bio and social networks. Experience includes your employment history. Education includes your degrees. If your LinkedIn already has all this, importing is a breeze, or you just add it yourself. Just takes a few minutes. Zerply bills itself as "The easiest way to present yourself professionally". It is pretty easy, to be honest. And it is fairly professional. Better looking than LinkedIn, more professional than About.me, reaching a safe middle ground. Of course, it helps Zerply that most folks have already added information about themselves in third party services, so importing is simple. Otherwise, data collection still takes time. But where they have a distinct disadvantage versus About.me is in the naming. About.me has a smart way to tell people about you. Zerply is a lot less catchy, and it will take some effort for people to do the crazy thing I did, like changing my Twitter "about me" link to Zerply over one of the other sites. Google, Facebook and LinkedIn are no slouches either when it comes to centralized profiles. Want in to Zerply? I do have a few invites, and you'll get some too, once you sign up. Start with this URL: http://zerply.com/invite/6ANB7VPDCWTz1ng.